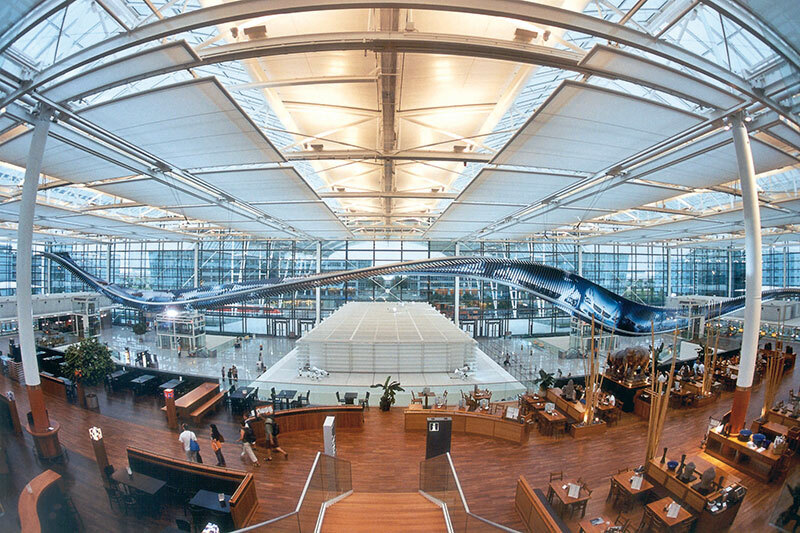 Munich airport performs all the functions of any other global mega city airport. But it doesn’t look or feel like an airport. Its massive amount of spaces have been designed so cleverly that you feel you are in an amusement park for adults. The spaces flow effortlessly between each level, with restaurants, services, check-in counters, lounges so creatively situated that each service comes as an unexpected surprise. Even the Immigration officials smile and refuse to look grim as in other German airports. From the outside, between the two terminals, the open spaces contain a park, with food courts, a beer brewery and even a live music concert area. The main entrance is like a hotel, its striking architecture enhanced by the astonishing steel and glass atrium. And from the top hangs a hundred-foot-long wing sculpture like a futuristic metallic bird about to take off. Below, a plethora of check-in counters ensures that there are no queues at all, with strategically located check-in automat machines. The high vaulted ceilings all aglitter with chromium and steel runners are more symbolic of a modern art gallery. Heck, even an art gallery exists on one of the levels. Situated right next to two Asian specialty cuisine restaurants – The Sushi Box and the Mangostin, serving Thai Food. Look there, a shoeshine shop for ‘touristed-out’ shoes! Brands line the expansive spaces inside with luxury temptations boldly beckoning. Buglari with diamonds and gems winking at you. Ferragamo, Cartier, Mont Blanc, ditto. Hermes, La Perla, Mango, Max Mara and others, blowing kisses your way.